Swim promoter, panel organiser, Moderator and former Observer and Sponsor of Diana Nyad, Steve Munatones said there would be people from Hawaii to Germany on the call, but mine was the only voice from outside the USA, and as such I felt uncomfortable, a token voice of the stuffy English Channel community. The bad European from Hollywood movies, my Irish brogue an unusual substitute for the more common clipped tones of a German or English film baddie, (apologies to my English and German friends)! Rampant paranoia, I have to admit. Because this wasn’t the world of swimming I know, the world of shite-talk about swimming, and craic* with friends at the Guillamene, in Sandycove or Dover, going for a Sandycove lap or three. Instead this was a world of famous swimmers, lawyers, media and manipulation. Other facts contributed to my paranoia. In the lead-up to the call, Steve Munatones emailed that he was looking forward to my contributions on the subject of the current. This set off more alarm bells for me. I write here about tides and currents for swimmers, but mostly tides because I think it’s a woefully under-represented subject that’s really important for safety, and if I can learn something and pass it on that’s helpful. Ocean currents are specific to their region and as such beyond my limited knowledge. I’m not even a sailor. The only ocean navigation map I have studied in any great detail is the English Channel map. I quickly disabused Steve of any notion that I claim expertise. I can understand the global and macro regional details but that’s about it and that’s only because I like reading about that stuff. It was enough that I had to suffer the essential charade of the panel. Can we agree that I did so you didn’t have to? I’ll stick mostly to my own input, with an occasional foray into other’s contributions as I saw them. Should any of the other panel members wish to add any comments here, please email them to me guys, and I’ll add them here (publicly identified Panel Members 1 to 10, number 11 Mike Lewis has his own paid outlet, he was a conflict-of-interest previous Nyad Observer, he can take a flying jump) . The call started with Moderator and Diana Nyad supporter and swim promoter Steve Munatones introducing everyone very briefly, extended introductions would have been interminable (like this subject) and intimidating (for me). Diana Nyad made a lengthy opening statement. The word respectfully was used by Diana Nyad again, apparently without any irony. It included a statement that she has never cheated in her life. As with almost everyone she said, I felt her statements were not for the panel or the subject, but with a firm eye to the media. Yes, I had preconceptions. I am not at all embarrassed by this. The significant first portion of the call contained John Bartlett outlining experience with his confirmation of the existence of the northerly current. Then we went through a round of Q&A with each member of the panel. John Bartlett answered some, Diana Nyad or Bonnie Stoll answered some others. Then next round would move onto the next subject. You can jump the technical parts by going straight from the bold arrow below, to the next bold arrow further down. I can swim in the winter in Ireland because as every Irish school child knows, the 50º+ North Latitudes of Ireland and Great Britain is kept clear of ice during the winter months by the North Atlantic Drift current. This is part of the Global Thermohaline Circulation, also known as the Global Conveyor Belt. The North Atlantic Drift current is fed by the warm Gulf Stream. The Gulf Stream comprises two main components, the important-for-our-discussion Florida Current and the Antilles Current which flows north and east of Cuba to where both join off the Florida coast. The Florida Current flows out of the Gulf of Mexico and Caribbean between Cuba and the Florida Keys, a long stretch of interconnected islands and atolls. Deep breath. The Florida current is fed by the warm waters and weather of the western Caribbean/Gulf of Mexico and must flow in a north-easterly direction to exit into the Atlantic, since of course there is land is the way otherwise. This gap between Florida and Cuba is known as the Florida Strait. A Strait, like the Dover or Cook Straits, is a narrow stretch of water that connects two larger bodies of water and as such is usually typified by strong currents, the so-called finger-over-a-garden-hose effect. To swim from Havana to Florida, Diana Nyad had to swim across this current to the north, when it would be trying to push her North-east, away from land. To see the effects on the path of a swimmer swimming across a normally three knot tidal current, look at the first section of almost any English Channel swimming map of which there are many out there. (Ignore Trent’s world record map as atypical). Aand relax. Part of the problem of analysing the swim is that Diana Nyad apparently swam almost due north across the usual flow of current or had it flowing directly behind her pushing her toward land. And she did so at a greater than world record pace. Bored yet? You will be. John Bartlett, Team Nyad Navigator essentially said that the team had the advice of an oceanographer who used a process the oceanographer called altimetry. This is a phrase for measurement of the ocean surface height, presumably from satellite. I have been unable to determine the origin or wide-spread use of this phrase in meteorology but I do know satellite altimetry is used to measure tidal movement. Measuring the ocean height would lead to the identification of upwellings and downwellings. These are the flows of cold water (upwellings) and warm (downwellings water of water from and to the ocean surface respectively. One will supposedly come with an anti-clockwise rotation, the other with a clockwise rotation, I can’t remember which is which. I do know that other things such as prevailing wind also affects the surface current direction of either. I’d like to point here out that I, a self-identified disbeliever of the Diana Nyad story and not-at-all-an-oceanographer-or-navigator, can convey this more clearly than any of the vague hand-waving of Team Nyad outside the panel, and apparently better than Diana Nyad, who was seemingly content to not understand any of this, as she herself said. I don’t really even want to go into the incredulous story of what they claimed about last year’s swim but briefly the pilot and handler knew the 2012 swim wasn’t possible but they went out for 40 hours of swimming anyway. Seriously. Correct identification of the current state of the ocean would allow Team Nyad to catch an anti-clockwise gyre (rotational current) across the prevailing north-easterly current and essentially catch a free ride to Florida, pushed by currents. It sounds good to a layman. I’m a layman, so I can’t really interrogate it. All this took quite a while and I found John Bartlett credible, like I found Diana Nyad’s webmaster Chris, (who unfortunately had nothing to do with the swim). I know, you are shocked, you thought I was going to argue with everything. If so you misunderstand me. John Bartlett says that he confirmed the presence or absence of this current over many trips out in the Florida Straits over at least two years, taking about 100 drift measurements. He spoke about using special equipment, but I’ve seen ordinary boats with regular GPS identify currents or lack thereof, so that means nothing one way or t’other, it’s just curious. I wanted to use my first round of questions in a particular area related to this so I started asking about the measurements. I wanted to get to a quantification of the area of measurement, and measurement deficiency, and a feel for the GIS grid of the prediction. No idea what I’m talking about? That’s ok, I doubt any of the other panel members did either and please remember I really am not even slightly expert in these areas. it might be worthwhile taking a jump over the following section, as I can tell you now it led nowhere. Here’s an analogy: Weather forecasting in the upper-latitude eastern United States is excellent and very detailed and specific in time compared to the western Irish Atlantic seaboard where it’s less accurate. Do you know part of the reason for this? The prevailing winds are the same for both in the same latitudes. But one of the factors that improves the US forecasting is the large number of sensors to the west. You can have a large number of sensors…because it’s land. West of Ireland is the Atlantic, and measurement is difficult because … deep water. Satellites are increasingly used but local sensors are still essential. The further apart the sensors the quicker minor variations between them turn in unexpected localised weather changes. Weather is a chaotic unpredictable system (technically a dynamic non-linear system), and this is exactly what the butterfly flapping its wings analogy is intended to convey. The GIS grid is the Geographical Information System, or more simply the size of the measurement grid. I was interested in trying to understand measurement time and distance intervals to see how granular they could get in identifying the magic current. To identify such a current, I think you would need a very small, very granular GIS measurement grid. Small in GIS terms is still intervals of miles. This line went nowhere, when John Barlett told us there was no Oceanographer to answer these details, so I stopped and I’m finally explaining here what I was trying to understand. If I had any chance of identifying the feasibility of the theory, I needed to understand how it is identified and measured. I know Forrest Nelson, President of the Catalina Channel Swimming Association had a conversation separately a few days before with John Barlett, but I don’t know any more than that. Oh, you want another more apt analogy, that speaks specifically to the subject of marathon swimming? 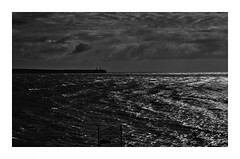 The English Channel waters, (yawn, yes here we go again, Diana Nyad supporters) west of Cap Gris Nez are the most swam marathon waters in the world and the highest marine traffic lanes in the world. The charts are therefore pretty complete and the waters relatively well understood. Yet, as many channel swimmers and pilots will tell you should you ask, (as I have ’cause I’m a Channel Junkie), unexpected currents, weather shifts and changes of timing regularly occur. Fast swimmers are slow, slow swimmer are fast. Tide show up 30 or more minutes early, or late. Localised micro-depressions appear (one did during Sylvain Estadieu’s swim) not visible on weather forecasts or radar. And this happens in an area with all this traffic and recording on both sides, and two actual marine traffic control centres exist. Get my point? Unpredictable, in a smaller area, even with fairly close measurements. So you can extrapolate from there why I was asking: I can guess cold water temperatures all I like based on experience, but I have to calibrate that against an actual thermometer. The Scientific Method considers physical testing (i.e. measurement) as important as the actual hypothesis. Intervals and measurement accuracy are important for understanding, and hence for prediction. Now there have been many public discussions of the biggest questions over Diana Nyad; the sudden and sustained speed increase, the direction, the lack of feeding. I’m not going to go through them one by one here but I will address them later. Once again, I point you back to the forum discussion which has all the relevant information. There will be no surprise data announcements in these posts. Instead I’m trying to do what I said to Diana Nyad I was going to try in my second round questions to her, to synthesize what was already available or discussed. Round 2. Seconds out. Let’s keep those punches above the belt. Penny Dean, a global legend in open water swimming, Steve Munatones’ and former US open water coach, former English Channel world record-holder and the woman who literally wrote the book on open water swimming, (sigh) had been at best sycophantic on the first round. She apologised to Diana Nyad for the questions she was being asked, obviously by the rest of us. But Penny had no right to apologise for us. Prior to any real discussion she congratulated Diana Nyad. I don’t like writing that and she is entitled to say anything she pleases given her record especially compared to me, but I really don’t know why she was on the panel, if this was “a review panel”. Possibly sensing the whitewash direction of the call, some of the panel shifted to a more direct path for the “second round”. Since I don’t want to speak for any of the panel I can say the questions varied and Barbara Held, someone who claims large admiration amongst marathon swimmers went directly to the point of the seven and half hours with no feeds. Dave Barra questioned which record Diana Nyad was actually claiming. Ron Collins asked about the apparent freshness of Diana Nyad immediately post-swim. Richard Clifford questioned on the discrepancy between videos and what was reported, such as apparent stroke rate, and recorded comments from the navigator. Evan Morrison asked specific questions about whether she exit the water or touched the boat and then about training. The answers were no (she didn’t exit), she couldn’t remember touching the boat, her speed is 50m per minute in training, i.e. two minutes per 100m but she can hold this “forever” and the unsolicited nonsense about peeing in the pool, again done for the media. I’ll have to let those guys give their own public impression should they wish to so do but they all sounded great to me. I didn’t feel alone. The call had already heard plenty of faux drawing-room courtesy, straight from Oscar Wilde with lots of effusiveness on both sides. I was somewhat sucked in, I’m now embarrassed to say. But this was an American call after all, I was the interloper, replete with Irish scepticism. When the second round of questioning came to me, I waffled too long in asking my question. I hadn’t prepared it other than having it on a vague list, as I had no idea which way the call would develop. So I winged it, which led to a too-long introduction from me. Why, in a swim with global visibility and of a commercial nature, therefore unlike any other swim, didn’t Diana Nyad set out to maximise transparency and use fully independent observers? We as humans are attuned to communication signals. I sensed, in the ether of telephonic cyberspace, where the words in a telephone network switch meet, that Diana Nyad had just crossed me off her Christmas Card list. The response was frosty and disingenuous, at best. As with earlier, I felt the answer really wasn’t going for me, but for the media, but further that I had made her uncomfortable. In the response, (no “I’m glad you asked that question” for me) Diana Nyad said that she had been out of marathon swimming for 30 years and was unaware of the rules, and wasn’t aware that she needed to personally know the observers. At this point Penny Dean intervened and started congratulating Diana Nyad again. So I had to stop her. 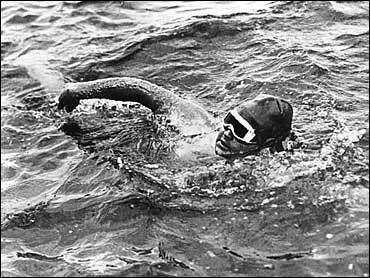 Me, a nobody, had to stop one of the most famous open water swimmers of the latter half of the twentieth-century from speaking. You couldn’t hear it in my voice but I think there was a quaver. It was in a way one of the most scary moments of my swimming life. I disabused Diana Nyad of her response. I said that the rules of marathon swimming go back 138 years and they were in place before she stopped and are well-known, and that I wasn’t postulating a mass conspiracy theory, nor did I believe in one. Essentially she was putting words in my mouth, (the old straw-man argument tactic, say your opponent said something they didn’t so you can knock it down). She responded again this time saying that no-one in the marathon swimming community reached out to her. This response was utter nonsense. If you’ve read the forum thread you will know that I said that a person (Ned Denison) had emailed Penny Palfrey, Diana Nyad and Steve Munatones 18 months previously with three options on how to handle a future swim, including an offer to actually set up an zero-cost official Florida Straits Swimming Association and allow Penny and Diana Nyad substantial input to setting out Florida Strait rules. Thus giving Diana Nyad exactly what she and her supporters have been saying, that only she or the first person to do it, which at that time could only have been Penny. You’ll also know from the forum that she said she never received it, despite that Penny Palfrey and Steve Munatones had, and that Steve Munatones was actually sitting beside her at that point. Steve neglected to mention this for the camera or anyone else. Diana Nyad said she couldn’t respond to an anonymous critic, which is fair, so I pointed out that the person (Ned) is an Honour Administrator in the International Marathon Swim Hall of Fame, which at least means a lot of people know him. When I said I would give the name to Steve Munatones privately, he never mentioned that he already knew whom it was. Why would she turn this down? I can postulate that any prior disclosure of any rules at all was still too limiting to what she had planned. On the forum Angel Yanigahara of Team Nyad later said that “perhaps only Diana, Chloe and Penny should make the rules for this body of water“. She is not the only supporter of Diana Nyad to make a similar claim. Indeed Diana Nyad herself back in the 1970’s claimed that the first swimmer got to make the rules, though of course Diana Nyad herself ruined the life of the first person to swim those waters, Walter Poenisch. Would you like that bread buttered on both sides, Diana? And how about a slice of this special cake-that-you-can-have-and-eat also? I also mentioned that Team Nyad had of course directly Tweeted me the previous year soliciting my opinion and input, as mentioned previously. As was the tone of the entire call, when it suited Diana Nyad, her team were responsible whether either things went right or things went wrong, to suit herself and she, a journalist, doesn’t know how to use Twitter or Facebook. I finished with the specific point that she had made two demonstrably incorrect claims regardless of what she had just claimed. With that I was done. My foreboding of a whitewash and setup didn’t waver. I think that the reason Diana Nyad didn’t use the panel more widely afterwards was that she assumed we would be more easily wooed or impressed or roll over. Many important questions were never answered or even addressed, especially the other Observation questions. Diana Nyad never did answer that question I’d asked. I got two hours sleep and left for Dover, hoping to decompress from this nonsense and to crew for Sylvain Estadieu’s English Channel butterfly. English Channel two-way legend Lisa Cummins was sitting beside me on the plane, and had to listen to it all, poor her. (If you haven’t visited Dover beach with Lisa, you really don’t understand how she is viewed). I’ve finished writing the series, I think. I’m not even sure how to describe the next part except it’s long. Long even by these standards. There will be a final part after that, just in time for the Global Conference in Cork. I didn’t originally plan it that way, I found no way to comprehensively cover the subject and we know that DNOWS won’t do it. Far too many words and too much time on this for me. *I refuse to clarify this post with a definition of the indefinable yet quintessential Irish word craic. The Diana Nyad Controversy, a personal reflection – Part 4 – Assisted or Unassisted? The Diana Nyad Controversy, a personal reflection – Part 5 – Probity & Integrity. Let’s see if I get the refund from Munatones..! If it will make you feel better, I’ll put you on mine. You just need to provide the stamps. If the call was not toll free, why should I have to pay for the postage on a Christmas card? Tell you what. Send me the card, it’ll get returned for postage not paid, you re-address to me, and we do that every year with the same card from now on? Well I, for one, wIll say that the question I asked DN was not answered directly, but was deflected with a long soliloquy about the dangers of box jellyfish. It was indeed a first hand lesson in political spin. This partial-call review is quite revealing. I hope you or someone can complete the review. Maybe in the next part? Another great article…I don’t know how you keep sane! That implies I am sane Ellery!